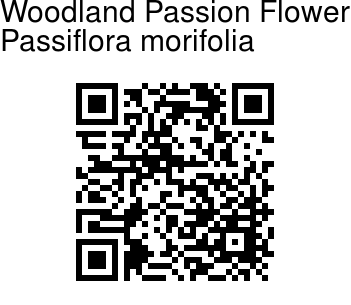 Woodland Passion Flower is a herbaceous perennial climber, cultivated in gardens but doubtful as an eflowering stem (see under Status). Stems grooved, slightly 4-angled, velvety when young; tendrils in leaf-axils are presents. Leaves are alternate, 3-lobed with ovate-triangular, pointed lobes, deeply heart-shaped at the base, thinly textured, somewhat roughly hairy on both surfaces; margin toothed or subentire; leaf-stalk up to 6 cm long, flattened, prominent glands at the tip; stipules ovate, about 6 × 3 mm. Flowers are borne singly, in leaf-axils, 2-3 cm in diameter. Sepals are white mottled with red inside, petals are white too. Corona with a single row of filaments, 5-6 mm. long, white with blue or violet bands. Fruit is spherical, 2 cm in diameter, blue-green, roughly hairy. 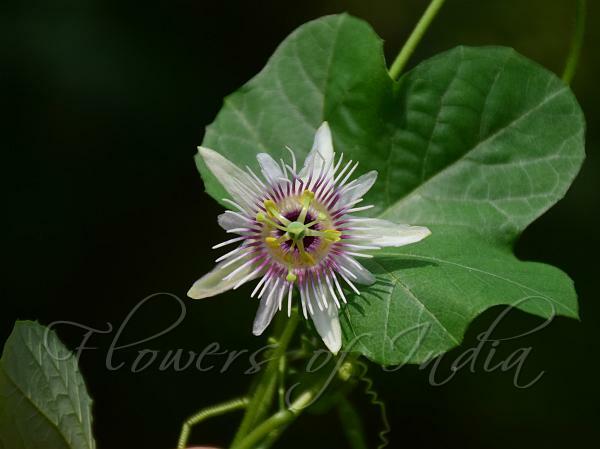 Woodland Passion Flower is native of South America and cultivated in some warm countries like India. Identification credit: Amber Srivastava Photographed at Botanical Survey of India, Dehradun.